It was again a week just busy enough that I’m comfortable splitting the Reading The Comments thread into two pieces. It’s also a week that made me think about cake. So, I’m happy with the way last week shaped up, as far as comic strips go. Other stuff could have used a lot of work Let’s read. Stephen Bentley’s Herb and Jamaal rerun for the 13th depicts “teaching the kids math” by having them divide up a cake fairly. I accept this as a viable way to make kids interested in the problem. Cake-slicing problems are a corner of game theory as it addresses questions we always find interesting. How can a resource be fairly divided? How can it be divided if there is not a trusted authority? How can it be divided if the parties do not trust one another? Why do we not have more cake? The kids seem to be trying to divide the cake by volume, which could be fair. If the cake slice is a small enough wedge they can likely get near enough a perfect split by ordinary measures. If it’s a bigger wedge they’d need calculus to get the answer perfect. It’ll be well-approximated by solids of revolution. But they likely don’t need perfection. This is assuming the value of the icing side is not held in greater esteem than the bare-cake sides. This is not how I would value the parts of the cake. They’ll need to work something out about that, too. 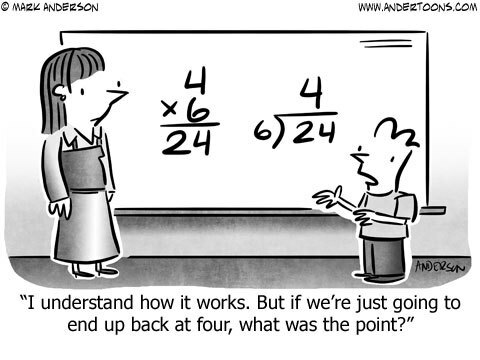 Bill Amend’s FoxTrot rerun for the 14th mentions mathematics. Young nerd Jason’s trying to get back into hand-raising form. Arithmetic has considerable advantages as a thing to practice answering teachers. The questions have clear, definitely right answers, that can be worked out or memorized ahead of time, and can be asked in under half a panel’s word balloon space. I deduce the strip first ran the 21st of August, 2006, although that image seems to be broken. Patrick Roberts’s Todd the Dinosaur for the 15th of August, 2017. Before you snipe that there’s no room on the teacher’s worksheet for Todd to actually give an answer, remember that it’s an important part of dream-logic that it’s impossible to actually do the commanded task. Patrick Roberts’s Todd the Dinosaur for the 15th mentions long division as the stuff of nightmares. So it is. I guess MathWorld and Wikipedia endorse calling 128 divided by 4 long division, although I’m not sure I’m comfortable with that. This may be idiosyncratic; I’d thought of long division as where the divisor is two or more digits. A three-digit number divided by a one-digit one doesn’t seem long to me. I’d just think that was division. I’m curious what readers’ experiences have been.